WMSC52 - 1 Year Anniversary of the Waltzingmouse Sketch! Today is a special day for the Waltzingmouse Sketch - it turns 1 years old today!! whoo hoo!! Can you believe it?!?! 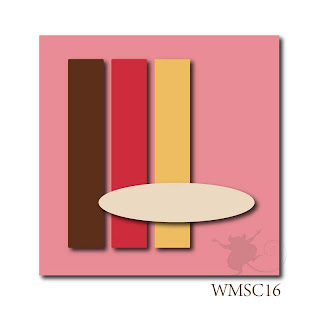 Be sure to read to the bottom of my post to see how you can win a WMS stamp set from me! To celebrate this special event we're doing something a little bit different today. Each Mischief Maker and Design Team member who is participating in today's sketch challenge has chosen a sketch from the past year and made a card for it. So you get to pick which sketch you'd like to use from all of those we have chosen!! How fun is that?!?! - you can see the sketch choices and all the details of this special sketch challenge over at the WMS Sketch blog. I die cut the banners out of felt with my Nested Lacey Penant Nestabilities. and I used Petite Oval Nestabilities to die cut my sentiment which is from the Say It Loud set. I'm thinking with the dark colors, the felt banners and minimal accessories - this would make a good masculine card, right?!?! So come along and join us for this special 1 year Waltzingmouse Sketch Challenge - you'll find all the details over at the WMS Sketch Blog! And now something fun for you - in honor of the 52nd WMS sketch - I'm offering one lucky person the stamp set I used on my sketch card today - Say it Loud!! 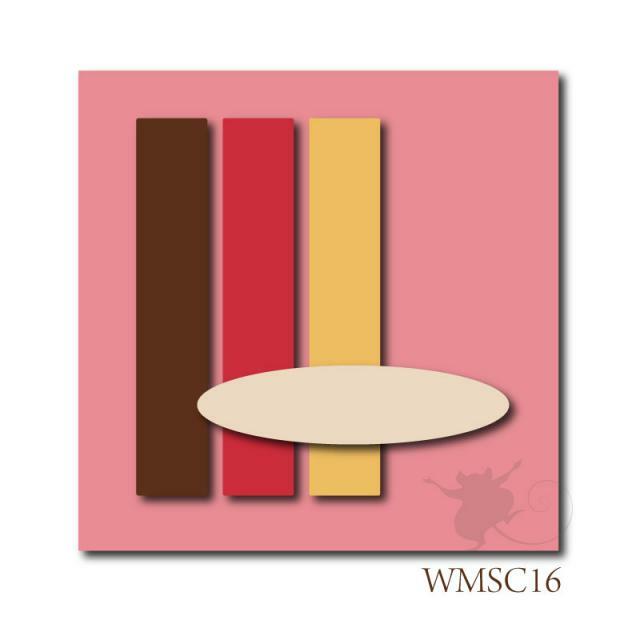 Leave me a comment telling me if you own any WMS stamps (and what's your fav set of those you own or those you want!) You have until Friday 6/24/11 at 11 pm EST to leave your comment - I'll post the randomly chosen winner on Saturday 6/25 with my WMS sketch posting - good luck! Paper: White, Ripe Avocado - PTI, Creamy Caramel - SU, Blue Bazzill Basics/Night Water. 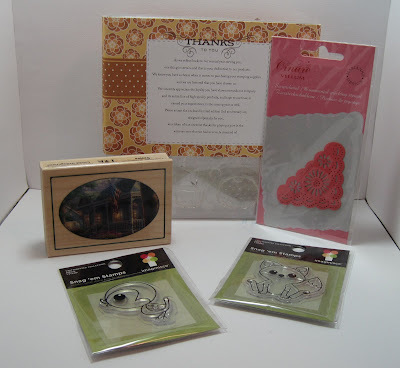 Accessories: Foam tape, oval petite Nestabilities, Nested Lacey Pennants Nestabilities, Felt - Michaels, Pretty Pearls Black - Amuse, Scor Tape. Stamps: Waltzingmouse - (plaid) Off Beat Backgrounds, (leaf) Blessed by You, (Fall Blessings) Peace and Plenty. Celebrate With Me! My One Year Blog-aversary!! Welcome to my one year blog-aversary! I can't believe it's been a whole year since I first hit that 'make your own blog' button on Google! I remember how nervous I was and how I had absolutley no idea what I was doing!! I had wanted to make a blog for quite some time but kept putting it off because I didn't really know how to do it - but finally I had to just jump in and do it because I was applying for design team positions and it was required - and I'm SO glad that I did! During this past year I have made 334 posts (boy, I need a life!) and had over 65,000 hits (thanks to ALL of YOU!!). I have learned so much from you and made so many wonderful blogging friends that I wanted to share my celebration! So what's a celebration without presents you ask??!! Well - how about these?! Included here: Twitterpated Collection - Foxy Stamp and Birdie Stamp by Imaginisce along with 8 coordinating 6x6 pieces of designer paper. 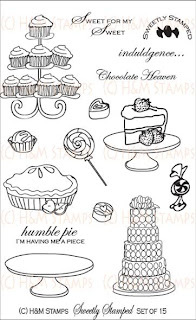 A package of Basic Grey Urban Prairie glazed brads, a 6x6 Urban Prairie paper pad (36 6x6 sheets), and two stamp sets from H&M Stamps - Sweetly Stamped (cake, pie and cupcakes - yum!) and Peaceful Decor - a stamp set of mix and match plants, pots, candles, apples and fun sentiments (retired). All you need to do to have a chance to win this blog candy is to leave me a message on this post. Easy Peasy! I'll have random.org pick a winner on Wednesday night (2/11) after which I'll post the winner. So - good luck! - thanks for joining in my one year blog-aversary celebration - and, as always, I greatly appreciate your stopping by! Exciting News and Some Blog Candy! I'm so very excited today! A couple of weeks ago Jennifer Meyer (Lovetostamp6 on Splitcoast) pm'd me and asked if I would like to be a guest designer on Our Creative Corner some Saturday in January. Well - let me think......... I didn't have to think at all really!! - I said YES with a little tremor running through my body! Yikes - what pressure to make something worthy! 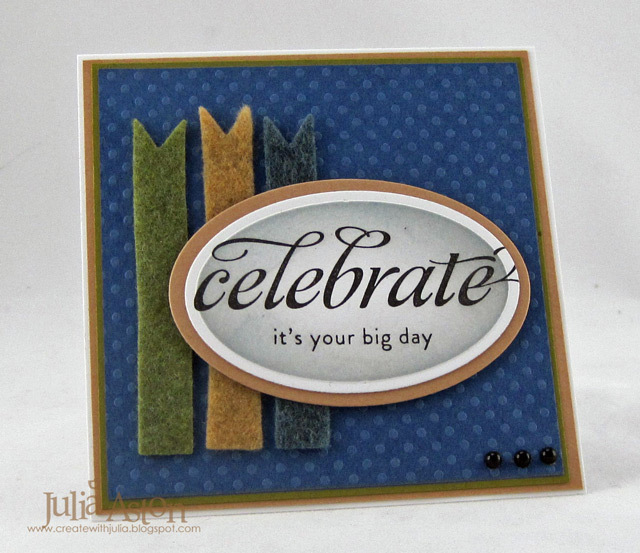 So today it was a color challenge - to make a card using just two shades of blue and a neutral color. I used Buckaroo blue from Stampin up and then some designer papers with a lighter blue on it - I guess it's like Baja Breeze with white as my neutral. I inked up my pretty angel from the Calling All Angels set from H&M Stamp Co. I clear embossed her to prevent the colors from bleeding when I colored her with Copics and Prismacolor markers. I cut her out and layered her over a stamping of the angel using foam dimensionals. I used my rectangle nestabilities and a lacy punch from Martha Stewart. The sentiment was punched with the larger oval punch from Stampin Up and layered onto a Design Label (SU) punched piece of card stock using foam dimensionals. I tied 3 pretty ribbons together and stuck a heart pin through it that I had added some simple beads to. And finally - I put some silver Spica pen on her wings and halo to give a little shimmer, which doesn't really show up in the pic unfortunately. I hope you stop by and check out the challenges at Our Creative Corner - they have a different one every Saturday morning to inspire you. You can also see their logo on my side bar with a link to their site! All you have to do is leave me a comment on this post. I'll pick the winner by random number.org and post it on Monday so be sure to check back! Thanks so much for coming by - please let me know what you think of my challenge card today! Hi everyone ! Sorry I'm so late in posting but I had my monthly hair maintenance trim and color and it took forever! They are both really cute stamps from H&M Stamp Co - you can see cards I made with them here and here. And now I want to share with you a year long challenge that I am so excited to be participating in over on Split Coast. "For 2009, we will be focusing on the Names of God. Every other week, I will post a name of our precious Lord along with a small devotion. 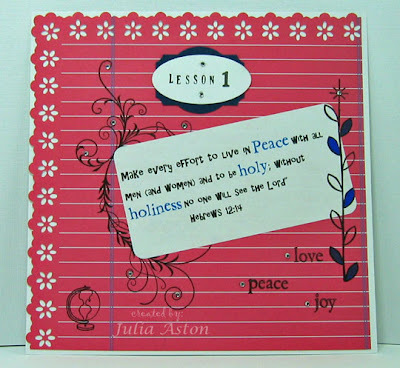 You then will find a key scripture or a promise associated with that name and create a scrapbook page, card, ATC, Rolodex card or whatever you feel like creating." She posts the challenge both on the Split Coast challenge thread and on her blog every other Sunday by 5 pm. The name of God she gave us for our first challenge was "Holy". I am going to be making 6x6 scrapbook pages and I will be putting them in protective sleeves and hanging them on a wooden rack (that DH is making for me even as we speak!) that I can keep on my desk at work or on a table at home so I can flip through them and reflect on the different passages I chose for each name of God as the year goes on. Here is my first page for the name HOLY: I chose Hebrews 12:14 as my verse: Make every effort to live in peace with all men and to be holy: without holiness no one will see the Lord. My NIV (New International Version) Bible has a Concordance in the back of it that list words (such as Holy) and lists all the verses where that word is used - so that is how I will locate and choose the verses for the challenges. I looked through all the Holy references until I found one that 'spoke' to me. I thought this one particularly timely given the conflicts going on in the world right now. And please notice my very own watermark on the bottom left corner! I FINALLY figured out how to make one on my Adobe Photoshop Elements 6 thanks to this wonderful tutorial by Kurtis that I actually found quite some time ago but never had the time to focus on until yesterday. I am just so excited by this little thing! I hope you will look into the "His Holy Name" challenge - maybe it's something you'd like to do this year also? Edit: I just found out that Heather at H&M Stamps has re-ordered the following stamp sets - so if you were looking for those during the sale - she should have them in her store sometime soon. What Color is a Cow? Blue, Green, or Orange??? By now you must have heard that Heather - owner of H&M Stamps - is having a blow out garage sale?? ALL of her stamps are just $3 - $5 per set! She's clearing out her shelves to make room for her new spring/summer sets! 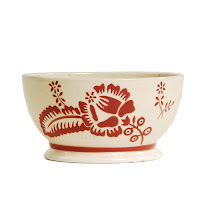 But they are going fast - some are already gone - so you may want to pop over there NOW and then come back here?! The challenge was to use blue, green and orange. Hard colors to use together! They seem to me to work best with kids stuff (primary colors I guess) so that's why I pulled out my Kiddie Farm set. 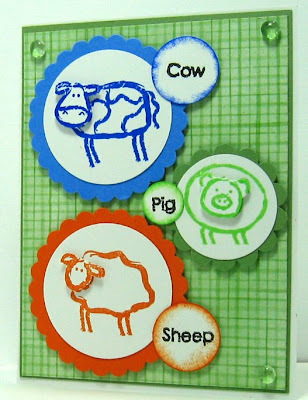 This card would be our 'let's learn our colors' card not a 'let's learn the real colors of animals' card!! LOL!! This really awkwardly angled shot (!!??) shows the layered heads and popped up circles. Be sure to check back here on Saturday morning - you'll have a chance to win blog candy from me of one of the H&M Valentine sets that sold out today! 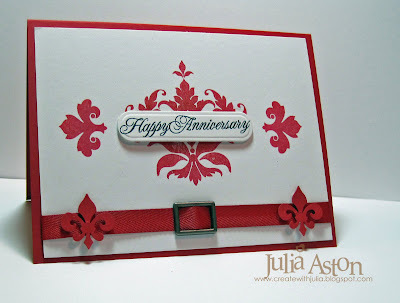 and check out fellow H&M DT member Carolina's blog - she's offering a gift cert to H&M Stamps. 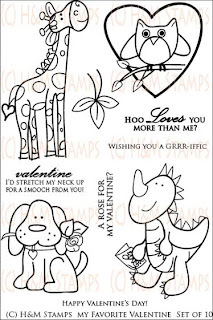 All of the DT members listed on my side bar are showing fun cards made with Heather's stamps so go visit them too! Please leave me a comment on this post to let me know if you went to the sale and bought something!!!! 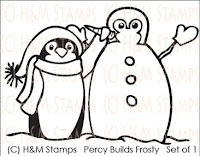 You can win one of the Percy stamps - I'll pick a random number winner on Thursday night! Edited to add: if you didn't go over to the sale - you can still leave a comment and be eligible to win!! As promised - here is some blog candy to celebrate my reaching 50,000 hits. It includes Twisted Sentiments (some kind of R rated!) by My Favorite Things, Grill a Fella by Stamping Bella, the fern punch by Martha Stewart, some brown tone chipboard buttons by Colorbok, and a Designer mat pad by K&Company. All you have to do is leave me a comment telling my why it is you stop by my blog! You have until Friday 12/12 at 7 PM EST to leave a comment - I'll post the winner on Saturday 12/13. 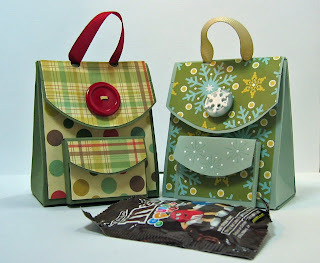 This also qualifies for Sharon's No Time To Stamp challenge and the Our Creative Corner challenge. For my second card today - I was inspired by this bag from Bath and Body that I got when shopping there a few days ago. I used the Three Trees set from Stampin Up (retired) and the sentiment from Silent Night by Papertrey Ink. I love the contrasts of the grey with the red and the simplicity of the one layer. This card also qualifies for Sharon's No Time to stamp challenge as well as the Our Creative Corner challenge that I linked to on my first card above. I appreciate you taking time out of your busy day to stop by here - have a great weekend - hope to see you here tomorrow! A Case of A Cookie Card - A Class - and Blog Candy! I've got lots to share with you today so stick with me on this longish posting! First up will be my card for today's Featured Stamper on SCS - Anne Ryan's gallery was featured today and I chose this lovely card to CASE. When you CASE a card you have to change at least 2 things - I used different stamps (but still the fun cookie theme! ), I put the ribbon across the top instead of side and I used slightly different colors. The gal holding the yummy try of cookies is from the H&M set 'Christmas is the Time for Cookies' and the sentiment is from the 'All About Birthdays' sentiment set. I stamped the cookies again on a scrap - colored and glittered them, then layered them over the main image. I also sponged and glittered the edges of the sentiment which is also up on foam dimensionals. I sponged over the scored lines on the cream panel with Bashful Blue ink to highlight the scoring. 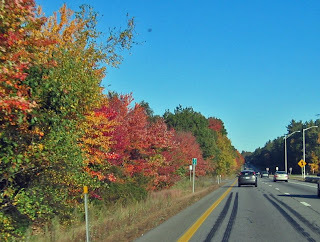 This was the terrific fall view on my drive up Rte 93 from Massachusetts to New Hampsire yesterday to get to the Papertree where I was teaching a class yesterday. And no - I didn't make those skid marks in front of me!! Yikes! I snapped these pics out my windows as I was driving along (oops! at least I wasn't on my cell phone! ) - it was so beautiful I just had to capture it. 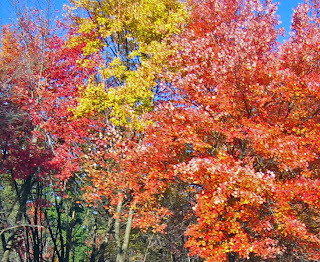 It was a perfect warm sunny day and the colors were on fire! 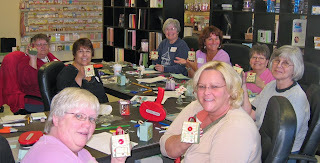 And here is the fun group at the Papertree that came to my class - each holding the first back pack we completed. From the bottom front left - that's Connie, then Dawn, Sandy, Marge, Gail, Charlotte, Janice and Priscilla - Marilyn was too shy to be in the picture. So a shout out to you gals! Didn't we have a fun morning! As I showed you yesterday - these are what we made and I'll be posting instructions later this week once I get my act together. And now as promised - BLOG CANDY! - I made 40,000 hits on my blog a few days ago and I am just so very thankful for and grateful to all of you who come by and have become my friends here - I'm offering blog candy for two lucky winners. Package #1 and Package #2. Package #1 above includes Get Wella Bella with the sentiments "Get Wella Bella" and "Hope You Feela Bella", Bridesmaid or bride Bella, and Hula Female Riley (I forget her name?). Also in this package are six 6x6 papers of Basic Grey: Archaic, six 6x6 papers of Basic Grey: Sultry and a roll of Papertray Ink Aqua Mist Satin Ribbon. Package #2 includes Corvette Bella with sentiment "I admire Your Drive", Bella carrying boxes of shoes, and Easter Egg Riley. Papers include: Six 4x6 Amy Butler double sided papers and six 6x6 pieces of Basic Grey Sultry and a roll of Papertrey Ink and a roll of Papertrey Ink Spring Moss Satin Ribbon. 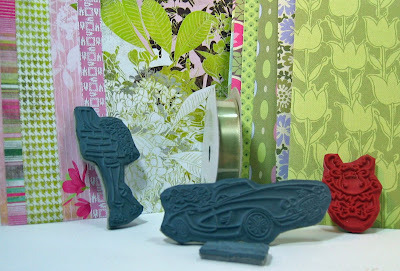 The stamps are all mounted on easy mount and ready to be used on your acrylic blocks. They are stamps I purchased and then never used so they are out of their packaging and I mounted them on the foam backing. All you have to do for a chance at one of these two prizes is to leave me a comment here on this post - If you are so inclined I'd love you to link this post on your blog to let people know about my blog candy. I will pick the two winners Friday night 10/17/08 by Random Number Generator - the first number picked will get the 1st package - the 2nd number picked will get the 2nd package. I'll post the winners on Saturday 10/18/08. Good luck and as always - thank you SO MUCH for coming by today!! 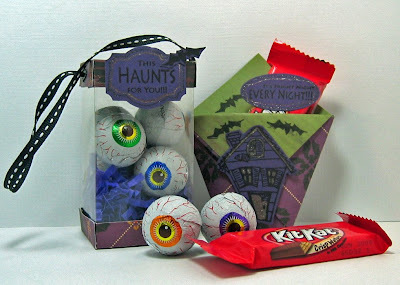 Frightful H&M Blog Hop - With Blog Candy! 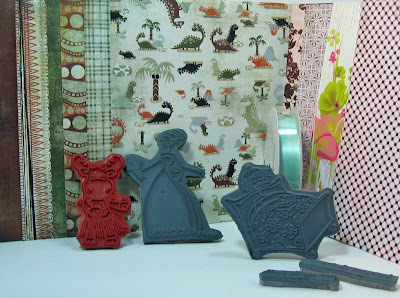 Hi Everyone - I am so excited to welcome you to the H&M Stamps First Design Team Blog Hop! All of the design team members (listed at the end of my post) have created a fall theme craft for you to be inspired by. And to add to the excitement each of us is offering a free H&M stamp set just for leaving us a comment!! 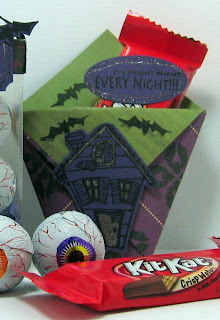 For my craft I created two treat containers for Halloween using the Fright Night Set. 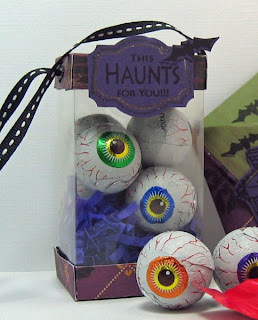 First up is this cute acetate box filled with creepy eyeballs (the chocolate, peanut butter and caramel filled kind!! Yum! ) (Edited to add: I got these at CVS. ) You can see instructions for this box here. I used a different pattern for the top and bottom than in the instructions - I just cut a 3 inch square and scored it 1/2 inch on each side - like the top on the 3x3 box on a Splitcoast Weekly Inkling seen here. I thought it came out a little neater. I put eyelets on the punched holes on the cover to add sturdiness and tied knots on the inside ends of the ribbon. The cover slides up the ribbon when you open it. 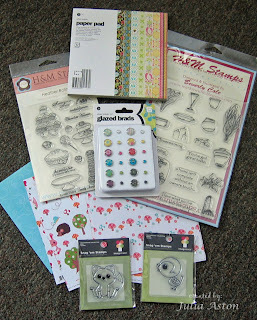 Now for the fun part - my gift to one lucky commenter is the Sweetly Stamped set by H&M Stamps seen below! How fun is this set with the ever popular cupcakes, cake and pie stamps and these super sentiments to make your cards a snap! Leave me a comment here and I will pick a random number winner on October 7th ! Every one of the Design Team members will be offering their own choice of an H&M Stamp set and you can enter on each blog (only once per blog though please!) so you have 10 chances to win a set! Please hop over to the other Design Team members below to see what fun creations they have to show you! Thanks so much for stopping by today - and good luck! Be sure to check back on Oct 7th to see if you've won! My niece, Katie, just got engaged and I wanted to share the cute story of how Greg proposed. They were going to Fenway Park to the opening day Red Sox game here in Boston. They are both avid Red Sox Fans. They had gone in on the subway and were walking through Boston Garden on their way up to Fenway Park. Greg said ' Let's sit here for a minute' and Katie thought that was kind of funny to stop but said 'Ok'. He started talking about how fun it was going to be to see the Red Sox get their World Series Rings and she agreed. Then he said 'How would you like to get a ring too?' and proceded to propose to her and give her a beautiful engagement ring! Then off they went to the game - and the Red Sox won! What more could you want for a fun night out??!! So I wanted to make a special card for them - I guess I should have put baseballs all over it! LOL! but instead I made this card that covers a whopping 4 challenges! I'm a little behind on my card making this week. I took last night off because I had some finishing of other cards to do so I tried to catch up a little today! I made my own designer paper using Flourishes scroll background stamp which covers the Limited Supplies Challenge - I used eyelets which was yesterdays Ways to Use It Challenge - I used Glitter Ice Stickles that covers Sharon's No Time Friday Challenge and I used Beates Weekend sketch! Phew! And here's the Blog Candy! Now for the fun stuff !!! - I hit 5000 views this week and I'm so excited - I wanted to thank you all with a nice Blog Candy offering! This is a brand new unmounted Golf a Fella by Bella Stamps. I can mount him on easy mount for the winner if they want it. I'm also including some 6" squares of masculine color DP's that you could use to make cards with the dashing fella! 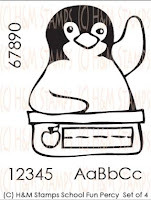 Just leave a comment and tell me something about your dad or husband or significant other that you would make a Father's day card for maybe using this stamp. I'll pick the winner by random number generator at 10 pm EST Wednesday night, April 16th so be sure to post a comment before then! Thanks for dropping by tonight! and good luck! Please e-mail me, [email protected] - with your mailing address and I'll get the stamp set and papers right out to you! Thank you everyone for all your wonderful encouraging comments - It means so much to me! I'm sorry you couldn't all win! - I'll offer blog candy again so keep checking back! So here it is! My first Blog Candy as a thank you for all of my new friends that stop by here to check out my craft offerings! I've hit 2000 views on my blog! 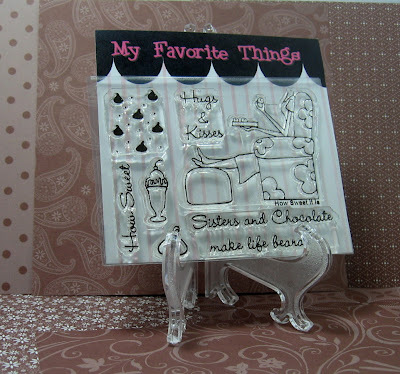 This is a new - never used - My Favorite Things set called How Sweet It Is - as well as six 6x6 squares of double sided Chocolate Stampin Up Designer Paper for you to use with this chocolate themed set. You can win this Blog Candy just by saying 'hello' and leaving me a comment - just click on 'comment' at the bottom of this posting. Be sure you are commenting here and not on another post. I will pick a random number to find the winner. You have until midnight Tuesday 3/18/08 to post your comment. Please note: If you check off annonymous when you post your comment - you need to put your name in your comment so that I will know who the winner is! Thank you everyone for checking out my blog now and then - I am so enjoying this and it means so much to know that people are coming by! I'll post the winner on Wednesday morning so be sure to check back!